Let’s all take a moment and think back to our elementary or middle school days. After a fun-filled weekend spent outside with friends, it’s Sunday evening, and you are still reveling in the laughs and carefree moments… Then in walks mom. But per the usual, your mom had a point. Having a fun-filled weekend is great, but if you don’t allow yourself some time on Sunday to recoup and think about what the week ahead will bring, then things might not go so smoothly for your Monday-Friday schedule — and thus begins a nasty procrastination snowball effect that will carry over for weeks to come. However, if you simply take advantage of the afternoon or evening on Sunday to look ahead, relax, and prepare for the weekdays to come, then not only will your week run smoother, but you will be ready for another fun-filled weekend rather than try to play catch up on everything you didn’t have a chance to do during the week. Here are some easy things you can do during #sundayfunday in order to make your week just a little bit better. Clean and Clean Some More! Nothing is worse than coming home to a pile of dirty dishes, laundry, and dust bunnies after a long day of work or school. Spend a little extra time on Sunday cleaning those dishes, folding your clean clothes, vacuuming, and picking up around the house so that on Wednesday night when you’re exhausted, the last thing you have to worry about is cleaning. Your house can instead act as an oasis away from the chaos of the day instead of adding more things to your to-do list. While this can seem like such an overwhelming task, it really isn’t. I promise! Not only will this save you tons of time during the week from worrying about making food for your lunch the next day and grocery shopping, but it will certainly save you lots of money too. While a $15 lunch at Panera Bread seems harmless, if you do that 3 out of your five days that quickly becomes $45 you’ll never see again and could’ve put towards bills or that pedicure you’ve been desperately needing! 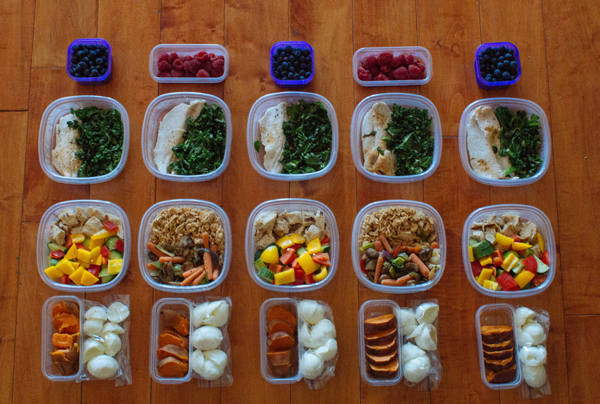 If you are daunted by meal prepping by thinking it will take you all day on Sunday to do; think again! According to a 2014 study in the American Journal of Preventive Medicine, 1,319 adults were asked about the amount of time they spent preparing, cooking, and cleaning up after meals. Of the respondents, 16% said that they spent less than one hour on food prep; 43% said they prepped for one to two hours; and 41% said that they prepped for two hours a day or more. So essentially, if you carve out 30-45 minutes to grocery shop and 1 to 2 hours on your Sunday to prep your meals for the week, then you are done! The weekday hustle and bustle doesn’t leave much time for getting much else done, especially relaxing. While being productive to prepare for the week ahead is important, having some much-needed downtime is just as important. Spend your Sunday taking a nap, reading that new book you bought weeks ago, light some candles and take a bubble bath. However you like to relax, do it, and your body and mind will feel rejuvenated and ready for whatever the week may bring. Take a few moments to look at your planner or calendar for the week ahead to see what you have in store. If you have a giant presentation on Tuesday and won’t have much time to prep for it on Monday, get a head start on it now. Set some goals for the week as well that you would like to accomplish and a plan to get that done. Turning your brain off from work or school on the weekend is easy and necessary to do sometimes, but no one likes to be surprised first thing Monday morning with a giant project or meeting that you weren’t prepared for. This one may seem silly, but I can’t tell you how much time I waste getting ready in the mornings when I am trying to figure out what I want to wear for the day, what shoes look best with my outfit, or what necklace I should choose. If you look at the weather ahead of time, think about your plans for tomorrow (meetings, dinner plans, etc.) and plan your outfit accordingly, you might even be able to catch a few extra minutes of sleep instead of tossing your entire closet on your bed in indecisiveness. Again, seems self-explanatory, but the number #1 indicator that your week is going to start off poorly is if you have to operate your Monday on 4 hours of sleep. Instead, try to shoot for a solid 8 hours of peaceful shut eye to ensure that there won’t be any bags under the eyes or falling asleep at your desk. According to a 2008 study done by U.S. and Swedish researchers, it showed that people exposed to mobile radiation took longer to fall asleep and spent less time in deep sleep. One easy way to ensure you get a good night’s rest? Leave your phone across your room charging rather than on your nightstand or in your bed. That way you won’t be tempted to check it at all hours of the night or before falling asleep, and you will have to get out of bed in order to turn off your alarm, a win-win! While it’s awfully tempting to spend your Sunday in bed ignoring all responsibilities, why not follow these couple of steps that will make your life that much easier come Monday or Thursday morning? What other things do you do on Sundays to make your week a successful one? We want to hear in the comments below! Resources: The Economic Times, Men’s Fitness, Life by Daily Burn. Interested in learning more about weekly planning on Sundays? Be sure to read Sunday The Game.